A lot of Irish places names have been appearing in my Project Copper posts and I said I’d do a brief overview. Disclaimer: I’m not a native Irish speaker, but I have a few words like many people. 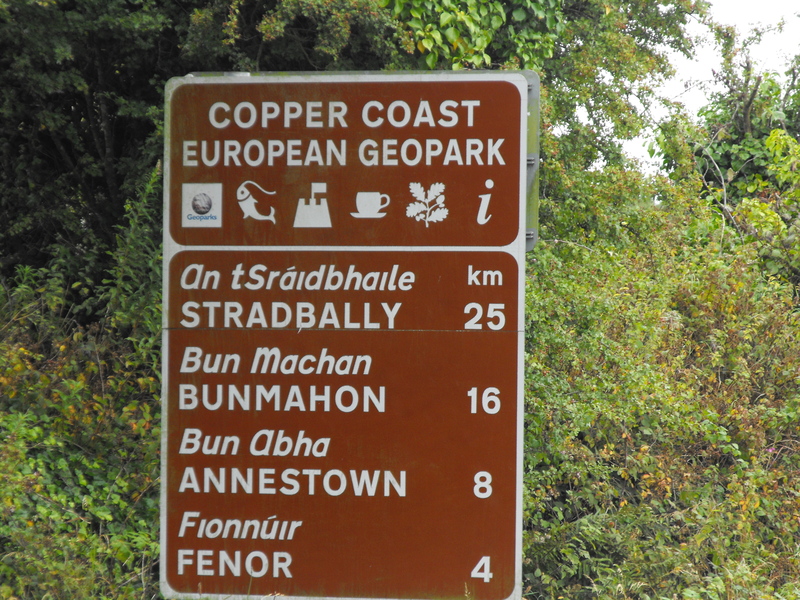 If you are from overseas, we don’t call it Gaelic, by the way, but there’s a commonality to Irish place names such that certain essentials are easy to grasp. First: Eveything in Ireland has a name. Everything. Fields, hills, beaches, rocks, apart from the bigger stuff. Every area in Ireland is divided in a province, then a county. Below that are townlands of which there are some 60,000. A townland might have only a few houses or even none. Maybe that feeds my desire to give my own names to some rocks when swimming past but when I am doing so, it’s always whilst wondering, “what is this really called or what was it first called?”. Second: Some names are old. Really old. Names can come from pre-Celtic, Celtic, Viking, Norman, or Anglo/English origins or even portmanteau or european language origins. Some names can be over 2,000 years old and bear no relationship to why they are so-called. Three: Old names get corrupted. Four: Celtic names particularly tended to relate to the geographical features. Fifth: Anglicisation of Irish names by British settlers or Crown representatives because the Irish spelling and broad syllables were difficult. (I have regularly difficulty with English people utterly unable to pronounce my name after they hear me say it, Evelyn in Varne still cannot handle it after 3 years of visiting Dover and her being half-Irish). –gh usually give an –f sound. –bh is a v sound. S– makes an –sh sound. The Irish language alphabet is only 18 letters and doesn’t have j, k, q, v, w, x, y, and z. Vowels with an accent overhead are long, e.g. á is usually pronounced aw, ó is oh. Some of the common repeating parts of Celtic names particularly can occur at the start or end of the name. Typically the noun is followed by the adjective like in the Irish language but it is often followed by a proper name of a person. The most common part name is Baile-. This is Irish for town OR townland. It was usually Anglicised to Bally or Balli, followed by a description. Kil– or Kill– are probably the other most common and comes from either of two Irish words. The first is cill, meaning church and the second is coill, meaning wood (forest). Sometimes it’s difficult to tell which was the original word. Next is probably Dun– from dún meaning fortress. Carraig– or Carrick– comes from carraig, meaning rock or stone, common to a lot of the small skerries and reefs . Tra– comes from trá meaning beach or strand. Bun- means bottom, ard- means high or top. Bun– is usually used for estuaries, followed by the name of the river or stream. Inis- or -inish– is island.Cnoc becomes Knock-, usually meaning a small hill. –An– or –an– in the middle of a name means –of the-. Ceann becomes Kin– from head, either animal or geographic feature. Guil– is black or dark, Gar– is a field or a grove, Beag is small and –Mór is –more or -mor which is big. And so on and so on. Bunmahon; the bottom or estuary of the Mahon river. Dungarvan; Garbhán’s (a person) Fort. Tramore; the big (or long) strand (strand is more common term than beach). Kinsale: the head(land) of the salty water. Helvick; a Viking name meaning rock-shelf. Annestown, you’ll see has an Irish name with it which seems to bear no relationship. Not that unusual, Annestown was a Protestant/Anglo village, so the name given was not derived from the name used by the Irish themselves. I don’t know what everything means, sometimes I’m not sure whether a trailing syllable(s) is an adjective or a proper name. Fennor, apparently means the sunny side of the hill (all I could figure was “white” or “bright”). Fun useless fact: Ireland has somewhere from 45,000 to 65,000 (Irish) family names. On a related note, the Irish Central Statistics office has put the entire 1901 and 1911 census archives online in their original format. I thoroughly recommend a visit.